A group of Ottawa-area bloggers braved the frigid temperatures last week and made it to the Clock Tower Brew Pub for our 5th meetup. Thanks again to everybody who came out and hopefully once the weather gets a little more user-friendly we can get more Ottawa bloggers to step out from behind the keyboard and come meetup for a drink and some good chit-chat. 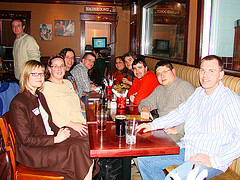 Last Wednesday both Ottawa bloggers and podcasters merged for a pre-holiday meetup. It was a great mix of people, good and varied topics of discussion as always. The Ottawa Podcasters crew even distributed a free CD loaded with some great audio to everyone who attended. Good times. The next blogger meetup is now scheduled for Wednesday, January 31st. Happy holidays, happy new year, see you in 2007! !